You are browsing the archive for visualization. 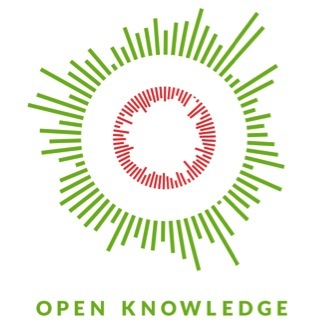 This post is written by Anastasia Valeeva, data journalist and member of Open Knowledge Russia, one of the local groups in the Open Knowledge Network. European Youth Press is organising a week-long intensive training on data journalism funded by Erasmus+. It is aimed at young journalists, developers and human rights activists from 11 countries: Czech Republic, Germany, Belgium, Italy, Sweden, Armenia, Ukraine, Montenegro, Slovakia, Denmark or Latvia. Together we will explore how to create a data-driven story step-by-step. If you have always wanted to learn more about what it means to be a data-driven storyteller, then this is an opportunity not to miss! Our course was designed with wanna-be data journalists in mind and for people who have been following others’ work in this area but are looking to learn more about actually making a story themselves. Modern journalism now requires considerable cross-border communication and collaboration. Examples of TheMigrantsFiles and Panama papers are impressive; but how do you become part of such teams? In this course, we are combining best practices of learning and doing. Mobile users can setup access to as many CKAN-powered portals as they want. Browse datasets from over 120 CKAN-powered data portals around the world by categories. Receive push notifications on your mobile device when new datasets are available from your selected data portals. Download and view data records (resources) on your mobile device. Preview dataset resources and create data visualisations in app before download (as supported by the portal). Bookmark/save datasets for later viewing. “Favourite” your data portals for future easy access. Share links to datasets on social media, email, sms etc. right from the app. In-app tutorial videos designed to help you quickly get productive with the app. Tutorial videos are available offline once downloaded. To ensure that ODC is usable by all CKAN portals in the wild, the app uses the publicly open and powerful CKAN API which is supported by all CKAN portals. By using the CKAN API to access portals’ data and meta-data, the app safeguards portals from external malicious attacks; more importantly portal administrators remain in control of the data being delivered to the public through the app. For instance, in order for ODC to provide in-app previews and visualisations of datasets, portal administrators must install the correct CKAN resource preview extensions. Basically, whatever dataset can be accessed from a CKAN portal website, can also be accessed by ODC through the CKAN APIs. Making your CKAN portal available to the mobile community through the ODC app is done in 3 easy steps. As a portal administrator, ensure your CKAN portal is running on CKAN 2.0 and above (at the time of writing latest CKAN version is 2.4); ensure your portal is publicly available on the World Wide Web. Finally, submit your portal details to the CKAN Census (where the app developer will periodically check for new portal submissions) OR submit the portal details directly to the developer through the feedback section of the app and the app website. That’s all! ODC is available for download on the Google Play Store and all feedback is welcome. The app is actively developed, so more features will be released. Send feedback through the app or follow ODC on Twitter. You can also read more about the ODC vision, objectives and features from the app website. Bringing CKAN Portals to the mobile platform is a big step in improving open data accessibility and reusability. It also opens doors to more public involvement in open data growth. I am excited to see what these new opportunities produce, first for the CKAN community and then for the Open Data community in general. To minimize bandwidth in the interest of often poorly-connected field locations, we built the preview from vector tiles. This means that details are removed at small scales but will reappear as you zoom in. The preview is created only for the first layer it encounters in a resource. If the resource contains multiple layers, the others will not show up. For those cases, you can create separate resources for each layer and they will be available in the preview. Multiple geometry types (polygon + line, for example) in kml or geojson are not yet supported. OGR2OGR to transform the data. Redis Queue to manage the transformation tasks. PostGIS to store the data. PGRestAPI to generate, cache, and serve the vector tiles. The Leaflet Vector Tiles extension to display the tiles client side. Our own GISRestLayer to tie it all together. Our architecture looks like this: The GISRestLayer orchestrates the entire process by notifying each component when there is a task to do. It then informs CKAN when the task is complete, and a dataset has a geo preview available. It can take a minute or longer to generate the preview, so the asynchronous approach — managed through Redis Queue (RQ) — was essential to let our users continue to work while the process is running. A special HDX team member, Geodata Preview Bot, is used to make the changes to CKAN. This makes the nature of the activity on the dataset clear to our users. Automatically generate additional download formats so that every geodataset is available in zipped shapefile, GeoJSON, KML, etc. Allow the contributing user to specify the order of the resources in the map legend (and therefore which one appears by default). Allow users to preview multiple datasets on the same map for comparison. Automatically apply different symbol colors to different resources in the same dataset. Allow users to style the geographic data, changing colors and symbols. Allow users to configure and embed maps of their data in their organization or crisis pages. Provide OGC-compliant web services of contributed datasets (WFS, WMS, etc.). Allow external geographic data services (WMS, WFS, etc) to be added to a map preview. Make our vector tiles available as a web service. If any of these enhancements sound useful or you have new ideas, send us an email at hdx.feedback@gmail.com. If you have geodata to share with the HDX community, start adding your data here. We would like to say a special thanks to Jeffrey Johnson who pointed us toward the vector tiles solution and to the contributors of all the open source projects listed above! In addition to GISRestLayer, you’ll find the rest of our code here. This post is modified version of a post on the HDX blog. It is modified here to highlight information of most interest to the CKAN community. You can see the original post here. Humanitarian data is almost always inherently geographic. Even the data in a simple CSV file will generally correspond to some piece of geography: a country, a district, a town, a bridge, or a hospital, for example. HDX has built on CKAN’s preview capabilities with the ability to preview large (up to 500MB) vector geographic datasets in a variety of formats. Resources uploaded (or linked) to HDX with the format strings ‘geojson’, ‘zipped shapefile’, or ‘kml’ will trigger the creation of a geo preview. Here is an example showing administrative boundaries for Colombia: To minimize bandwidth in the interest of often poorly-connected field locations, we built the preview from vector tiles. This means that details are removed at small scales but will reappear as you zoom in. The preview is created only for the first layer it encounters in a resource. If the resource contains multiple layers, the others will not show up. For those cases, you can create separate resources for each layer and they will be available in the preview. Multiple geometry types (polygon + line, for example) in kml or geojson are not yet supported. CKAN 2.3 is out! The world-famous data handling software suite which powers data.gov, data.gov.uk and numerous other open data portals across the world has been significantly upgraded. How can this version open up new opportunities for existing and coming deployments? Read on. One of the new features of this release is the ability to create extensions that get called before and after a new file is uploaded, updated, or deleted on a CKAN instance. This may not sound like a major improvement but it creates a lot of new opportunities. Now it’s possible to analyse the files (which are called resources in CKAN) and take them to new uses based on that analysis. To showcase how this works, Open Knowledge in collaboration with the Mexican government, the World Bank (via Partnership for Open Data), and the OpenSpending project have created a new CKAN extension which uses this new feature. It’s actually two extensions. One, called ckanext-budgets listens for creation and updates of resources (i.e. files) in CKAN and when that happens the extension analyses the resource to see if it conforms to the data file part of the Budget Data Package specification. The budget data package specification is a relatively new specification for budget publications, designed for comparability, flexibility, and simplicity. It’s similar to data packages in that it provides metadata around simple tabular files, like a csv file. If the csv file (a resource in CKAN) conforms to the specification (i.e. the columns have the correct titles), then the extension automatically creates the Budget Data Package metadata based on the CKAN resource data and makes the complete Budget Data Package available. It might sound very technical, but it really is very simple. You add or update a csv file resource in CKAN and it automatically checks if it contains budget data in order to publish it on a standardised form. In other words, CKAN can now automatically produce standardised budget resources which make integration with other systems a lot easier. The second extension, called ckanext-openspending, shows how easy such an integration around standardised data is. The extension takes the published Budget Data Packages and automatically sends it to OpenSpending. From there OpenSpending does its own thing, analyses the data, aggregates it and makes it very easy to use for those who use OpenSpending’s visualisation library. So thanks to a perhaps seemingly insignificant extension feature in CKAN 2.3, getting beautiful and understandable visualisations of budget spreadsheets is now only an upload to a CKAN instance away (and can only get easier as the two extensions improve). To learn even more, see this report about the CKAN and OpenSpending integration efforts. Sam Leon, one of Open Knowledge’s data experts, talks about his experiences working as an School of Data Embedded Fellow at Global Witness. 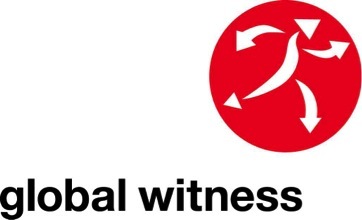 Global Witness are a Nobel Peace Prize nominated not-for-profit organisation devoted to investigating and campaigning against corruption related to the extractives industries. Earlier this year they received the TED Prize and were awarded $1 million to help fight corporate secrecy and on the back of which they launched their End Anonymous Companies campaign. In February 2014 I began a six month ‘Embedded Fellowship’ at Global Witness, one of the world’s leading anti-corruption NGOs. Global Witness are no strangers to data. They’re been publishing pioneering investigative research for over two decades now, piecing together the complex webs of financial transactions, shell companies and middlemen that so often lie at the heart of corruption in the extractives industries. Like many campaigning organisations, Global Witness are seeking new and compelling ways to visualise their research, as well as use more effectively the large amounts of public data that have become available in the last few years. As part of my work, I’ve delivered data trainings at all levels of the organisation – from senior management to the front line staff. I’ve also been working with a variety of staff to use data collected by Global Witness to create compelling infographics. It’s amazing how powerful these can be to draw attention to stories and thus support Global Witness’s advocacy work. The first interactive we published on the sharp rise of deaths of environmental defenders demonstrated this. The way we were able to pack some of the core insights of a much more detailed report into a series of images that people could dig into proved a hit on social media and let the story travel further. 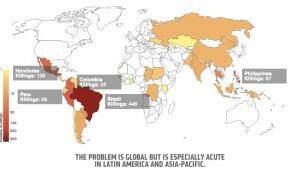 See here for the full infographic on Global Witness’s website. But powerful visualisation isn’t just about shareability. It’s also about making a point that would otherwise be hard to grasp without visual aids. Global Witness regularly publish mind-boggling statistics on the scale of corruption in the oil and gas sector. Take for instance, the $1.1 billion that the Nigerian people were deprived of due to the corruption around the sale of Africa’s largest oil block, OPL 245. $1.1 billion doesn’t mean much to me, it’s too big of a number. What we sought to do visually was represent the loss to Nigerian citizens in terms of things we could understand like basic health care provision and education. 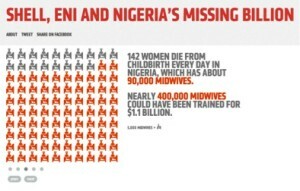 See here for the full infographic on Shell, ENI and Nigeria’s Missing Millions. 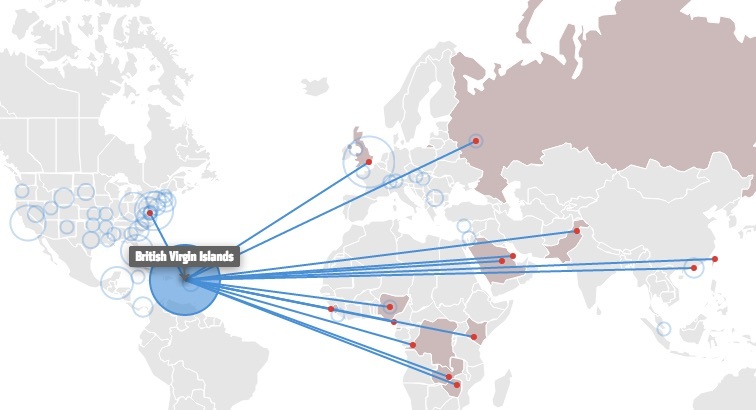 In October 2014, to accompany Global Witness’s campaign against anonymous company ownership, we worked with developers from data journalism startup J++ on The Great Rip Off map. The aim was to bring together and visualise the vast number of corruption case studies involving shell companies that Global Witness and its partners have unearthed in recent years. It was a challenging project that required input from designers, campaigners, developers, journalists and researchers, but we’re proud of what we produced. Open data principles were followed throughout as Global Witness were committed to creating a resource that its partners could draw on in their advocacy efforts. The underlying data was made available in bulk under a Creative Commons Attribution Sharealike license and open source libraries like Leaflet.js were used. There was also an invite for other parties to submit case studies into the database. For more information on the School of Data Embedded Fellowship Scheme, and to see further details on the work we produced with Global Witness, including interactive infographics, please see the full report here. The CKAN Association is always looking to further enhance the visualization options available for the CKAN data management platform. We are therefore delighted to connect with the Institute for Visualization and Perception Research (IVPR) at the University of Massachusetts Lowell and the Open Indicators Consortium who have led the development of Weave (Web-based Analysis and Visualization Environment), a richly featured, open source data visualization platform for the web. Visit the Weave wiki which provides everything needed to install and explore Weave. We will keep you posted on new developments as they arise. In the meantime, interested developers should join the Weave-users and Weave-dev google groups to connect with other developers working with Weave.